Quest continues to enjoy her time inland. As with the previous week, she has spent most of her days in Brampton, Ontario. She took one trip west into the Toronto suburbs, but it seems like she’s feeling comfortable staying away from the water for now. According to the latest from the rehabber taking care of Jemison she is beginning to heal. The broken bone in her shoulder is re-calcifying. Calcium is essential for bone strength so this is very good news. She’s feeding herself, another good sign. 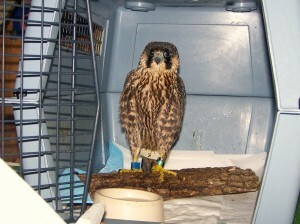 The next stop for Jemison is a two-week stint in a large flight cage where she can exercise her wings. Then more x-rays will be taken to see how things stand. We’ve heard from the rehabber taking care of Jemison. She’s doing very well, and she’s scheduled for an x-ray tomorrow. The radiograph should give them an idea of how well Jemison’s broken bone has healed. We’ll let you know as soon as we hear the results of the x-ray. 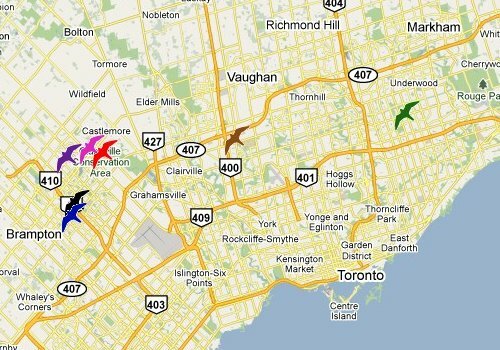 It appears that Quest has decided to move north of Toronto for a while. Her most recent few days’ locations have placed her in nearby Brampton, Ontario. The satellite view of the map there shows parkland and plenty of multi-story buildings (including the local Police station), so it would appear that she has good perches and at least the potential for plentiful prey. June Summers, President of the Genesee Valley Audubon Society, and Rochester Falconcam member Carol Phillips paid a visit to Jemison and provided the picture above, along with a report of her progress so far. She continues to be feisty and is eating everything given to her. Jemison also enjoyed the cooling spray of water that you can see in the picture at the left. All hopes are that her injured shoulder will heal quickly. Her wing continues to return to a normal position, and another rehabber who looked at Jemison couldn’t even detect an injury, so that’s very good news. We’ll be sure to keep you updated as to Jemison’s progress. The DEC has made arrangements to transport Jemison to the same rehab facility outside of Syracuse, New York, which was so instrumental in nursing Mariah back to health. 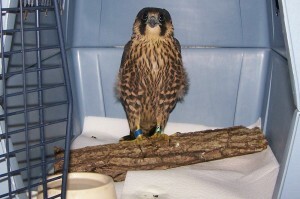 They have over 30 years’ experience treating falcons and returning them back to the skies. Their facility includes a very large flight cage where Jemison will be able to practice flying. The Rochester Falconcam wants to extend our sincere and heartfelt thanks to Gary and all the staff at Black Creek Wildlife Center, and especially to Dr. Parsons. Also to Terry and the good folks at Wild Wings for supplying some falcon-appropriate food on short notice. Our gratitude also goes to Dr. Gerald Balonek at the East Ridge Animal Hospital, where Jemison was taken by Rochester Animal Control. Without the selflessness of all involved, Jemison’s outlook could have been much worse. We’re also grateful to the DEC’s Mike Allen, Jenny Landry, and Barb Loucks for their advice and assistance, and to the Rochester Police Dept. and Rochester Animal Control, both for Jemison’s initial rescue and for letting MAK, our on-scene watcher at the time, know of Jemison’s condition. And finally, a huge “thank you” to our volunteer fledge watchers, who have spent many hours on the “front lines” keeping an eye on all of the falcons, especially our newest flyers. It is their dedication that helps to ensure positive outcomes for the fledglings in Rochester, and gives them the best opportunity to lead successful lives as masters of the sky. If you’ve been following the reports from our volunteer fledge watchers, you know that Jemison got into trouble flying on the Friday before the July 4th holiday and had to be rescued. If you haven’t been following the news, you can catch up HERE. The Veterinarian who is taking care of Jemison performed an x-ray today and the results are in. Jemison has a break in her right coracoid bone, part of her shoulder. Her long-term prognosis is uncertain right now, but there’s good reason to be optimistic. In young birds like Jemison bones heal fast, so as long as the bone heals in the correct position, she has a good chance of flying again. As you can see from the picture above, Jemison’s right wing is much closer to the normal position than the drooping that our watchers witnessed this past Friday when she was rescued. The Vet also reports that Jemison is feisty and eating well, all good signs. He plans to feed Jemison a diet that includes additional calcium to help with bone growth and healing. You are currently browsing the Imprints blog archives for July, 2010.